In honour of "On Wednesdays We Wear Pink" (I've been watching Mean Girls again! 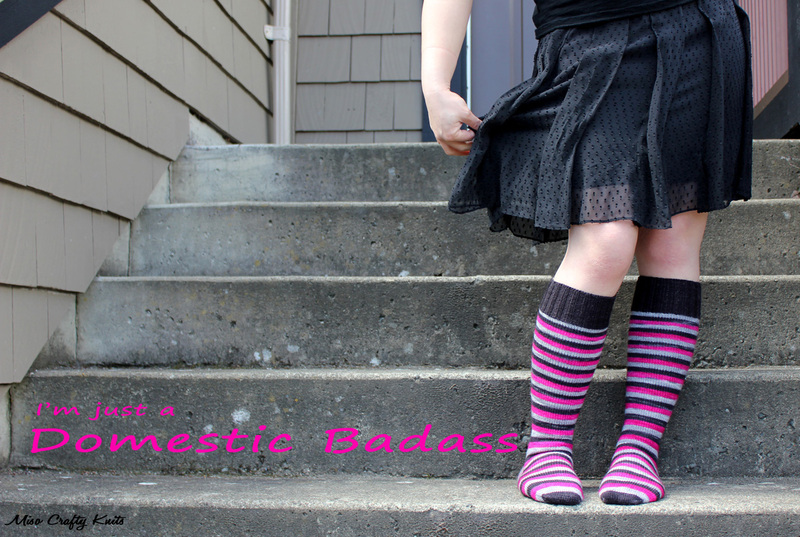 ), I give you another project that's long overdue for some blog love and mad props: my Domestic Badass Pair of Socks. I really have no idea why it took me so long to blog about these kickass knee highs. I didn't have a million ends to weave in, I didn't have to sew a seam, and I didn't have to fix anything. So what gives? Yeah, I'm just going to chalk it up as me being downright too lazy to take proper photos of them (yet I was willing to Instagram the crap out of them while I was knitting them up!). But wait no more! Here you go ladies and gentlemen! My killer knee socks known as Domestic Badass!! Anyhoo, before I head into La La Land and start daydreaming about frolicking around in a field full of yarn (and throwing balls of angora in the air...only to get fluff in my eye), let's talk more about the socks. Yeah? I can't remember what I've said about them before, it's been so long (oops!) but this pair was the pair that helped me to develop my own basic, plain vanilla, toe-up sock recipe. I knew that I wanted to use up every.last.single.inch.of yarn and so a toe-up formula was a must. I used my favourite go-to sock cast on method, Judy's Magic Cast On (Cat Bordhi does an excellent video tutorial that will really help you to remember how to do it. I always refer to this whenever it's been a while and need a refresher), then I had knit my magical number for length before knitting my afterthought heel row. My original plan was to knit a short row heel, but my friend Andi, who has knit a gazillion pairs of socks (she got inspired by the Yarn Harlot and did her own self-imposed sock club), suggested that I try using the afterthought heel since I was using a self-striping yarn. The afterthought heel would help to keep the stripes all nice and uniform, and eye-pleasing, and not break up the colours to form some sort of weird pooling action. Basically, it would help make the sock look more like a commercially made one. I know, I know, what's the point of knitting your own socks if you want them to look commercial. But trust me on this one. Afterthought heels are pure magic on self-striping socks! I've never knit proper knee high socks before so I really h didn't know what to do for the calf increases. I perused the patterns and projects on Ravelry, and did a little Google-fu on the subject before deciding to do the increases in sets of 2 at the back of the calf using my favourite go-to increase (in case anyone cares to know, it's M1L/M1R because they beautifully mirror each other), and worked them so that they stacked just on the outside of each other creating a "V". You can't really see them in any of the photos, but they're there. I knew I was going to run out of yarn before I could even start the ribbing, and I didn't want the socks to be at a weird length. I hemmed and hawed over whether or not to ask Em to dye up another skein so I could continue on, but in the end I decided that the colours may not match perfectly and it would probably be better to use a solid colour for the ribbing anyways. So a hunt for black sock yarn was on. Black. Sock. Yarn. That's a basic colour, right? Um...yeah, I had THE hardest time trying to find black sock yarn!! Victoria has 4 yarn shops. I went to them all. No one had black sock yarn. I even called a few shops in Vancouver and came up with nothing!! Again, Em came to my rescue (I think she laughed at me actually, when I told her at a knit night that I couldn't find black sock yarn anywhere she chuckled and was all "um...I can dye you a skein of sock yarn you know") and within a week I had black sock yarn in my possession. And even better was the fact that the bases matched. Yay! Geez, how many photos can I show you of a pair of socks?? Meh. To say I love these socks is an understatement. I mean, I LOVE these socks. I LOVE this colourway (thank you times a gajillion trillion million Em!!). I love it. I love it all. I love how they make me feel girly. I love how they make me feel a bit of a badass. I love that I've baked cookies wearing them. Wouldn't you want to do that with a colourway name like that? Funny what a simple pair of socks can do for your psyche. If you want a Badass skein for yourself, I'm sure if you asked Em really, really, really nicely (and maybe bribe her with chocolate and cold hard cash), she could probably dye you up a skein to call your own. If you do, tell her Miso Crafty Knits says hi! And then come back here and let me know. That way we can be twinsies! Or just go and check out the rest of Em's goods in her Everything Old Etsy Shop. And then come back and let me know what you got...cause I'm nosy that way. And I like to live vicariously through other knitters' yarn shopping experiences. Ok, last photo, I swear! These socks are awesome - I have serious sock envy right now! Thanks Andrea! :) They definitely make me giddy every time I wear/look at them! I love these! And your quest for black sock yarn was hilarious ... who knew it would be so hard to find?! These are awesome! So glad you finally got around to knitting that yarn up, its so pretty and the pink is perfect! Thanks Lois!! :) I think everything about these socks are perfect! Hahaha, thanks Sheralynn! I have "meaty" calves, and so increases were a definite must!! I think there's more info on my Ravelry project page as to what I did for that! And yeah, about the ordering my own, done and done! Yeah, I was a bit of a fan-girl about these. Right after you posted the yarn, I went and played on her website, but none of the self-striping colourways really called to me. But for my Christmas swap, I got something dyed up for my partner, and I think she asked me if I wanted something for myself. And I, twisting my toe into the ground, confessed that I wanted colours just like yours. And I have them and I love them. Is it creepy that I did an after-thought heel too? Oh yay!! :D We can totally be twinsies!!!! ♥ And no, it's so not creepy that you did an afterthought heel too!! Cause really, there's no other way that would keep the striping action in tact, right?? To me it's the only heel method that would do the stripes any justice!